How do you get to Carnegie Hall at the unlikely age of 47? Obsessively nurture a dream for decades. Take a detour around any kind of normal life. Practice the piano for six hours a day, every day. For tens of thousands of hours over the years. Practice instead of doing almost anything else. Practice until you wear out the felt hammers of your Steinway grand. Practice until your husband finally demands a 2 a.m. curfew so he can sleep, then frequently break it. That’s the path classical pianist Yoko Sata Kothari, of Lake Park, took to win a piano competition in middle age, which includes the invitation to play a 15-minute solo on Sunday at one of the most famous concert halls in the world. “I really felt like I finally made it to the top,” said Kothari. It’s been a long climb. When she takes the stage in New York on May 21, she’ll be playing where Leonard Bernstein made his conducting debut, where Pablo Casals, Igor Stravinsky, Bela Bartok, Vladimir Horowitz, Glenn Gould, even Billie Holliday, Bob Dylan and once, that other Yoko — Yoko Ono — have played. Making it to Carnegie Hall would be a huge accomplishment for a 14-year-old prodigy or a 23-year-old graduate student. It’s almost unheard of for a middle-aged musician. The classical music world, it turns out, is almost as ageist as Hollywood. Finally getting past the stage door of Carnegie Hall justifies all the other doors she closed in pursuit of the music she loves. She has no children, very little social life, she rarely goes to parties or out to dinner. She practices so she can perform. Kothari was growing up in Japan when her piano teachers realized she had perfect pitch. “In the second grade, they realized I could name the keys just by hearing them,” she said. While she chats at her kitchen table, a beeping car alarm goes off in the neighborhood. She listens for a moment. “C sharp,” she says. After winning a Japanese piano competition at age 8, Kothari’s parents bought her a baby grand piano. “My mother had always wanted to play, but wasn’t able, growing up in Tokyo before World War II,” said Kothari, who said her mother lost her house in a bombing raid during the war. Kothari sits down at her Steinway, which takes up most of the small living room. The rest is filled with black lacquered Japanese furniture. Her feet have worn a bald spot in the animal hide rug beneath the pedals, which she plays while wearing equally threadbare Japanese slippers. Her black curly hair obscures her face as she begins the unusual piece she’ll play at Carnegie Hall. “Fantasia” by Ferruccio Bosoni is a 1909 piece by a composer best known for his Bach piano arrangements. His own works are complex, modern and difficult. “I thought about playing Liszt, but I wanted to play something unique,” she says. Her hands alternately pound and caress the keys, as somewhat atonal rhythms dance and collide in the air. Kothari’s passion is for performing. After college in Tokyo, Kothari came to the U.S. at age 24, hoping to find more performance opportunities than were available in Japan. She chose Palm Beach County because she had a friend living in Wellington. She applied for a teaching job at a music school that Dilip Kothari, a classical guitarist, had opened in North Palm Beach. When Dilip, an avid outdoorsman, resumed his big-game hunting and fishing trips around the world, Yoko had uninterrupted time to practice. 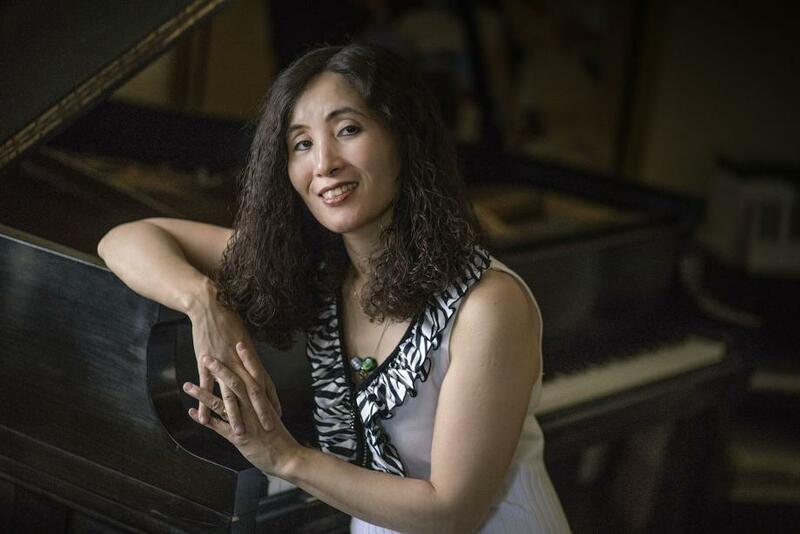 South Florida classical music fans know Yoko from her solo performances as well as appearances with the Boca String Quartet, the Lotus Duo and Trillium Piano Trio. She frequently plays in Japan and has performed in China and Italy. Each summer, she creates an inventive solo program for the next season around a single theme. One year, it was “The Weather Forecast” that included Beethoven’s “The Tempest” piano sonata and “The Last Rose of Summer” by Mendelssohn. Another year, her theme was “Go Green,” filled with piano pieces devoted to nature. She introduces each piece with a little talk and always includes familiar pieces entwined with something most audiences have never heard. “I’m here to help the audience to experience this beautiful work, I’m just a tool. I have the gift to be the bridge between composers and an audience,” Kothari says. She’s weirdly calm about playing her 15-minute solo at Carnegie Hall. The other, mostly far younger, first-place winners asked about practice rooms. Not her. “I know this piece. If I can’t play it, it’s not because I don’t know it, it’s because of here,” she says, her hands on her temples. She’s recorded four well-received CDs at Saturn Sound studios in downtown West Palm Beach. She’s also been a finalist in other prestigious competitions, including ones in which everyone else had a doctorate in music except her. This first-place award is a sign that her years of dedication — and frustration — were not in vain, as she sometimes suspected. “People who choose this path are either destined or delusional; I just didn’t want to be delusional,” she said. “After that, I thought, ‘OK, maybe I’m not delusional. Maybe I am good enough,’” she said. Good enough, finally, for Carnegie Hall. On her four CDs, Yoko Sata Kothari plays Bach, Chopin, Ravel, Beethoven and Liszt. They’re available at the Kothari’s D&Y Music Studios in North Palm Beach, as well as Barnes & Nobles, Chafin Music in Lake Worth and on Amazon.